Hoop making reached its peak as the fore-and-aft sailing rig proliferated in the mid-19th century, and flourished until World War II. Relatively few men practiced this craft even then, and consequently, exhibits such as this are rare. The hoop maker specialized in the manufacture of wooden mast hoops of assorted sizes which held the sail to the mast on fore-and-aft rigged vessels. 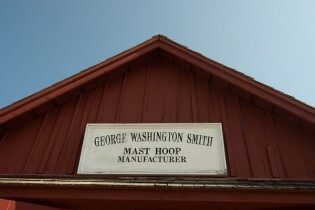 The equipment in this building was used by the Smith family in Canterbury, Conn., until well into the 1930s. Hoops were only one of the many products that came from their woodworking shop: the Smiths also produced wagons, wheels, clothespins, washboards, stable forks, and belaying pins. During the growing season, this work was generally put aside in order to devote time to their orchard.